Greg wasn’t kidding. 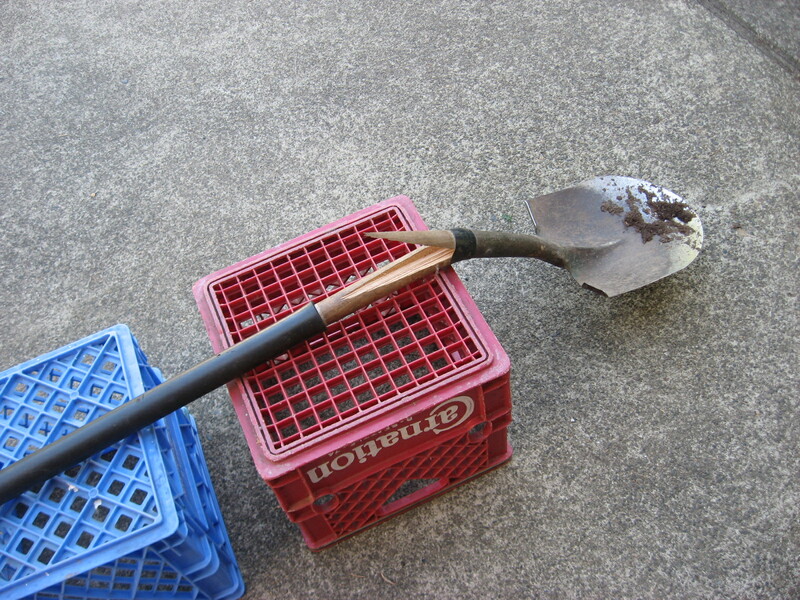 I used that shovel in the yards and gardens of the three houses we’ve owned, digging holes for the A-Z of green growing things that Special D has planted and digging out the remains of plants that displeased her. I moved rocks. I dug post holes. I dug a ditch when one of our pipes burst underground and the plumber, who couldn’t maneuver a back hoe in the confined space at the side of our house, threatened to do it himself for a breathtaking $100 per hour. 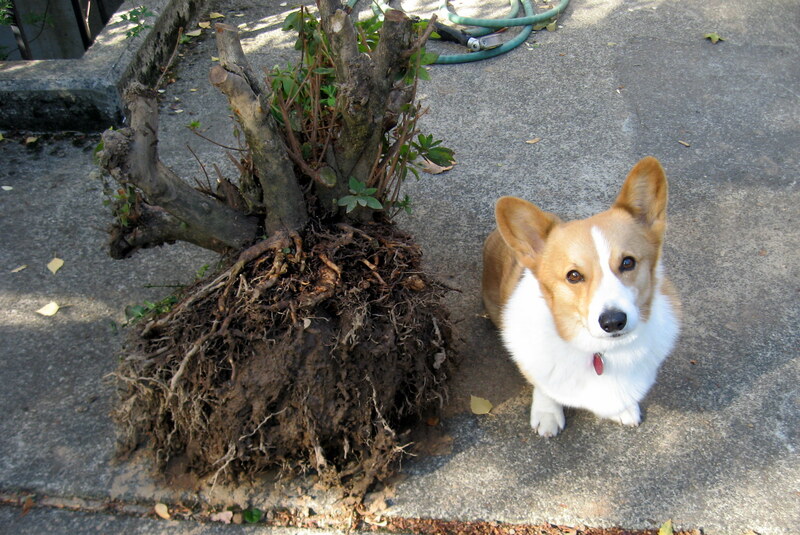 Notice: No corgis were hurt or inconvenienced in the extraction and removal of this stump. This corgi received a transfer of one (1) Alpo Snap as soon as he was released from duty. But last week I fought a four-year-old vine maple stump and the stump won. My shovel gave me 25 years of good service. I wish I could give you the name of the manufacturer but I long ago wore any corporate iconography off the handle. As a New Englander, I hate waste. What was I going to do with a broken shovel? 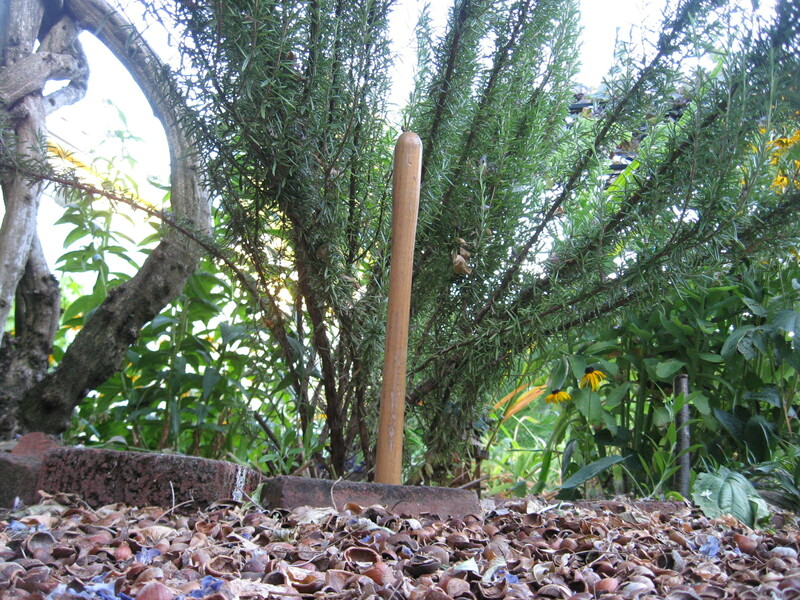 Turn it into a stake for the garden. You pound these into the corners and when you drag your hoses across the lawn the stake keeps you from decapitating something your spouse might get wicked mad about. Here’s the patient before surgery. Cut off the blade. I took it to my local recycler and lowered it, after a moment of respectful silence, into the metals bin. 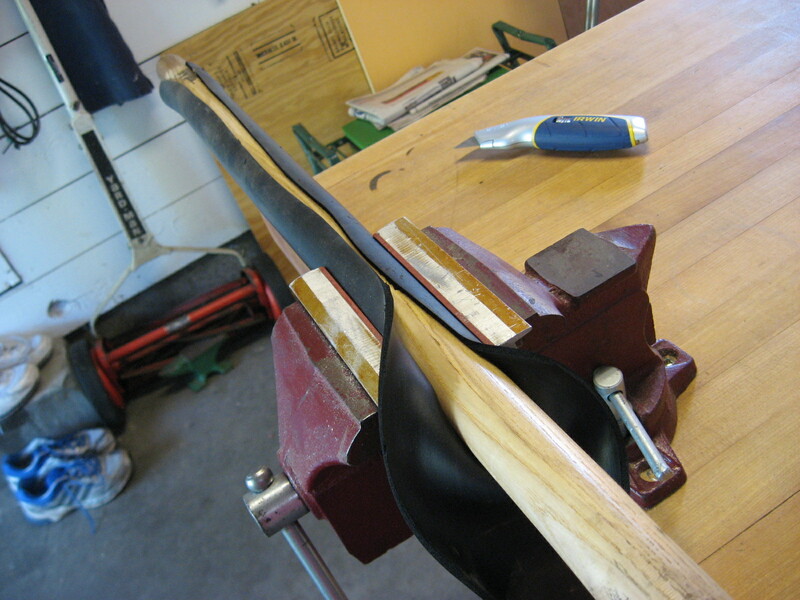 I sliced off the rubber jacket, which amazingly had stayed snug to the handle all these years, and exposed the original color of the wood. 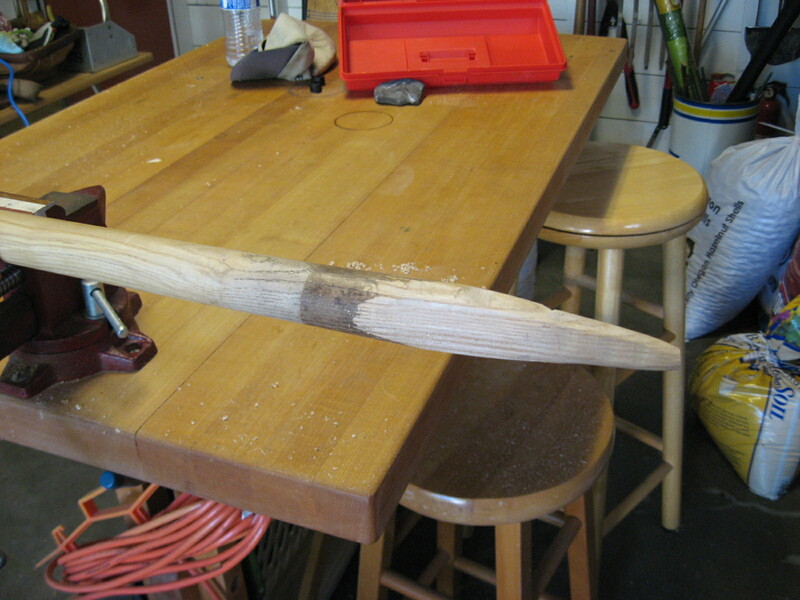 Then, through a mysterious process known only to me and Black & Decker, I sharpened one end. What if you don’t want to wait until you break a shovel? You could invite me over to break one. Better yet, go to estate sales. 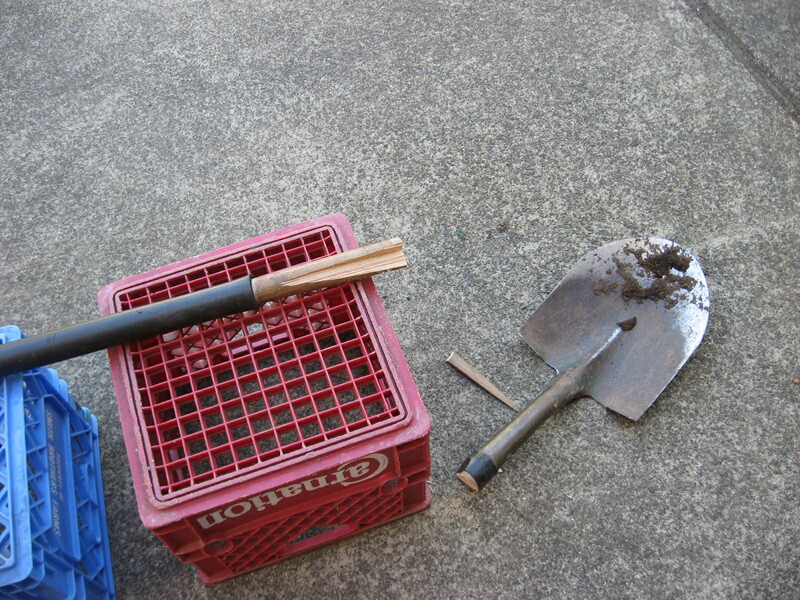 The people who are passing away now and taking leave of their earthly possessions bought long-handled garden tools in an era when those handles were made of a dense wood that lasts a long time underground and exposed to the weather. I usually find them for a dollar or two. Recycle the metal business end and I won’t yell at you! Next post: I’m gonna fill you full of lead (No. 2-5/10). Some beautiful piano work here, particularly on “Dixie Flyer,” but most of it sounds like Mr. Newman’s many many many soundtracks. The rap parodies were funny in 1988, if you were white and nervous about rap. And yet this is the guy who gave us Sail Away (how can you beat “You Can Leave Your Hat On”?) and the soundtrack to The Natural (which brought the whole movie to life).